What Size Fits My Car? Place the carrier on a clean roof and (preferably) on a Protective Mat. Find the bag with the label Top Strap and open it. Slide the top strap left-to-right under the 2 front strap guides located at the top of the carrier. 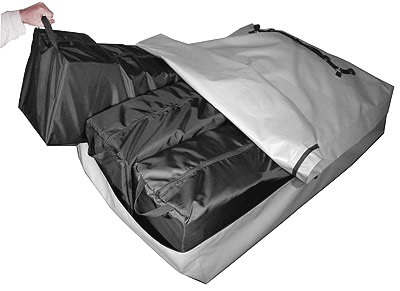 The side of the carrier without zipper should be facing the front of the car and RoofBag logo should be facing the back of the car to keep the aerodynamic shape. Front of carrier should be at least 8 inches behind front edge of roof, to minimize wind noise and improve gas mileage. Flip up the corners of the zipper flap to facilitate opening and turning corners. Open zipper and fill carrier while it's on top of the car since the carrier may get too heavy to lift once it's full. 6. Load the carrier as full as possible. A fuller bag provides a smoother ride. 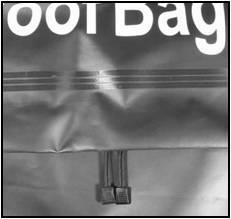 Place more items toward the rear to preserve the bag's wedge shape. Cushion hard or sharp objects to avoid fabric damage. Close the zipper completely until the two zipper pullers meet at the back. 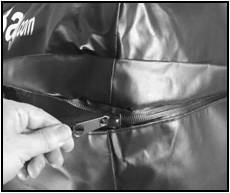 Make sure you leave no open gap between the zipper pullers or rain may enter your carrier. Fasten the straps as described on the links below and then adjust the length by pulling the free ends of the straps. Straps should be snug but not over-tight. Tuck the free ends under the straps, to avoid strap flapping. Follow the specific instructions below and the corresponding diagrams for your situation. A 30-day returns policy applies to unused car top carriers. A 2-year repair/replacement warranty covers: fabric puncture or tear, fabric and seam waterproofness, failure of straps, buckles and other hardware, seam separation, zipper operation and integrity, and separation of welded components. Not covered: damage caused by falls, accidents, improper installation, natural wear and tear, or failure of the car's components used to attach the carrier to the car. More details in Warranty and Returns page.